I'm a retired pediatrician, a high school teacher, and a Dad. I'm on the short side of this mortal coil thing now. I ignored decent advice when younger, and I expect you'll do the same. Still, it's a chilly late December eve, and I'm in the mood to pontificate. Harmonica, kalimba, maybe an ocarina. While mastery of a fancy instrument gets you glory and a better shot at a decent college, being able to bend notes on a mouth harp will give anyone about as much joy as she can handle. Cheap joy's hard to beat. A $2 magnifying glass changes the world. Microscopes are clunky, require prep, and can freak out any child who's paying attention. A decent loupe gives a child just enough new stuff to stimulate the mind without careening into existentialism. The Kids' Paper Airplane Book let's your child build 16 paper airplanes. Or get grandpa to show her how it's done. Flight fascinates even the cynical among us. Get a book on origami. Few of us use our hands for anything more useful than banging on a keyboard. Let your child experience the joy of human evolution--fingers were made for folding. Plant a basil seed in a Dixie cup. Put a carrot top in a bowl on a windowsill. Scatter wheat berries on a vacant lot. Maybe, just maybe, your child will grasp that a farmer matters more than a financial analyst (or even a teacher). Every child who eats critters should slaughter at least one before they get too cynical to fully appreciate the sacrifice made by the animal he eats. There is an instant just before the moment of slaughter that hangs frozen forever. I don't like to kill. I like to eat.The connection matters. Maybe the best gift you can give is one that takes away. Destroy her television, disable his X-box, toss the iPad into the fireplace. Share your stories, share your time. Trust what you know to be true. None of us get out of here alive. 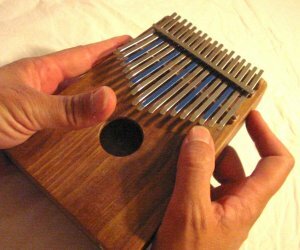 The kalimba picture is by Mark Holdaway, Kalimba Magic (www.kalimbamagic.com). One of the greatest gifts my parents have given me was a set of origami books at a very early age. I still fold swans and boxes and flowers to de-stress when I get a free moment or two. Also, it's always a neat trick to impress my students when I fold a crane out of a Starburst wrapper. I agree with the cheap instrument suggestion. I was given the world's tiniest one-octave piano when I was but a wee lass and it led to being able to read sheet music and play upon a full piano. Of course, this all improved my math skills. Which led to me being a science teacher. I liked that mini-piano even more than my household toy chemistry kit or my microscope. I agree with your list! And while I can't keep instruments of death in my classroom, for obvious reasons, I fight to not only keep the rest of that list in my room, but to have time for exploring and noodling with them every day. The other teachers hate that I teach my kids to use their balls though. I learned origami as a child from a woman who came over from Japan after World War II. An amazing gift--both for me and for the hundreds of children who love the cranes made over the years. It is amazing how seemingly small events can change our lives. I loved magnifying glasses as a child--literally changed my world view. Maybe I should have left out the death part. Maybe the balls part, too. Still, both matter. Thanks to everyone for writing!